Welcome to My Images and Words this week. Love this theme Linda. Thanks for stepping in! Bull replaces the word Ogre in the Quote! Wonderful shot, Indeed - they sure look like they're mates. 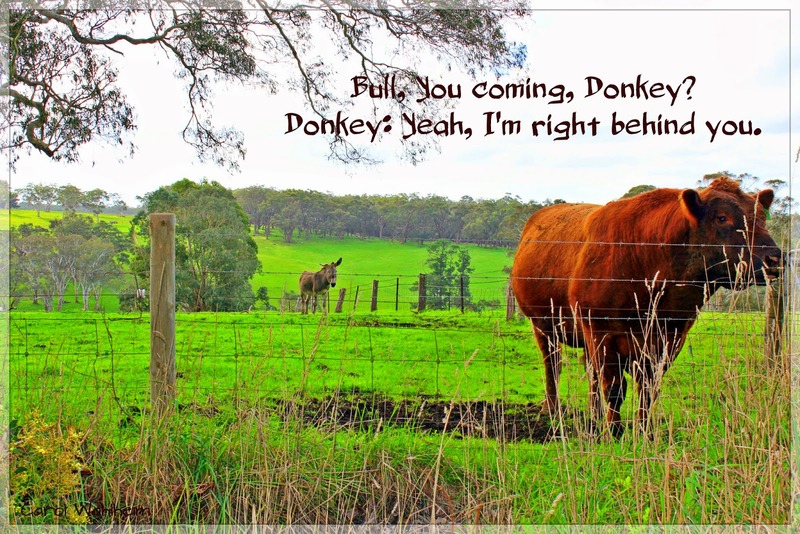 Even better in Blogger.....the donkey is so much clearer and the grass and weeds outside of the fence is much bolder in color. excellent shot....thanks for posting, Carol! You never disappoint, Milli! Excellent entry! Thank You Anders. They do look like mates for sure!!! LOL Hee Haw back at you Mandy!!! Thanks for the encouraging Comment. Being that it was a very overcast Winters Day with drizzle around the shot was as clear as I could get in that type of light. The grass was a lovely winter green and I am glad that you were able to pick up more detail in the photo here on Blogger. thanks so much for hosting! Thanks so much Belita!!! Not do You!